When I was on holiday on the Gold Coast with my family earlier this year, every evening we would see large numbers of bats flying around. I haven’t seen many bats before, so I did some research and found out that they are called black flying foxes. These large bats have a wingspan of up to one metre, making them Australia’s largest species of bat and one of the largest in the world. As their name suggests, they are mostly black, but they also have a dark brown collar around their neck. Even though many people are scared of bats, these guys are harmless. They like to feed on nectar and pollen and I noticed that they have a very long tongue that is well designed for such food. They also eat fruit and can be a pest to farmers with fruit orchards. Like most species of bat, the black flying foxes are nocturnal and come out at night to feed. During the day, they roost upside down from tree branches, often in very large colonies. They like to use trees that overhang water, which helps to keep them cool in the warm climates that they live in. At breeding time, females give birth to one baby every year. Baby flying foxes are called pups and they are carried around by their mother for the first month. They can fly on their own after just 2 months. 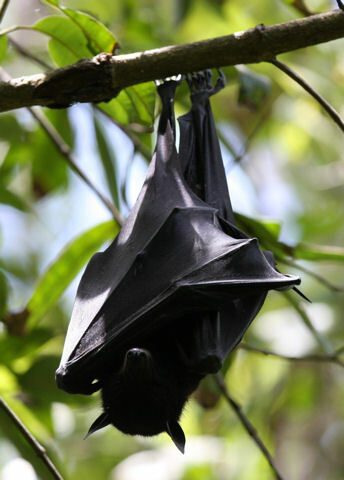 Black flying foxes are very common and can be found across northern Australia, Papua New Guinea and parts of Indonesia. Their range seems to be moving further south in Australia over the past few decades. Are there any other interesting facts that you would like to share about black flying foxes?